The present paper describes a number of sociohistorical transformations of the city of Galway in the west of Ireland that bear linguistic importance. After giving a brief introduction into Galway as a geographi-cal place, historical and recent changes in the city’s evolution are discussed with a view to their socioeconomic, ethnic and linguistic characteristics for three major periods: Old Galway (1100–1600), Early Modern Galway (1600–1900), and Modern Galway (1900–2016). 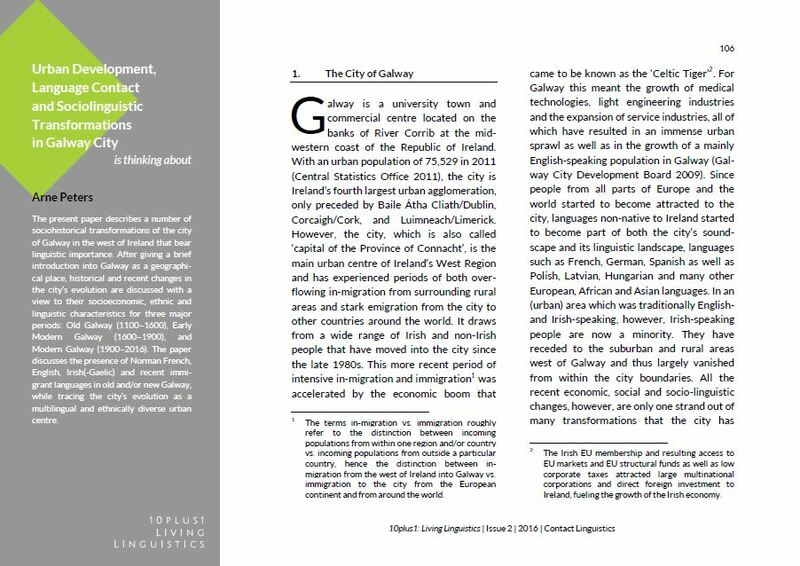 The paper discusses the presence of Norman French, English, Irish(-Gaelic) and recent immi-grant languages in old and/or new Galway, while tracing the city’s evolution as a multilingual and ethnically diverse urban centre. Arne Peters works as a lecturer and researcher at the University of Potsdam (Germany). His main research interests involve the fields of language variation and change, variationist and cognitive sociolinguistics, corpus linguistics, multilingualism and World Englishes. He has recently published a monograph on linguistic change in Galway City English (western Ireland) and he is currently working on cultural conceptualisations and language patterns in both various corpora of Irish English and a newspaper corpus of Black South African English.